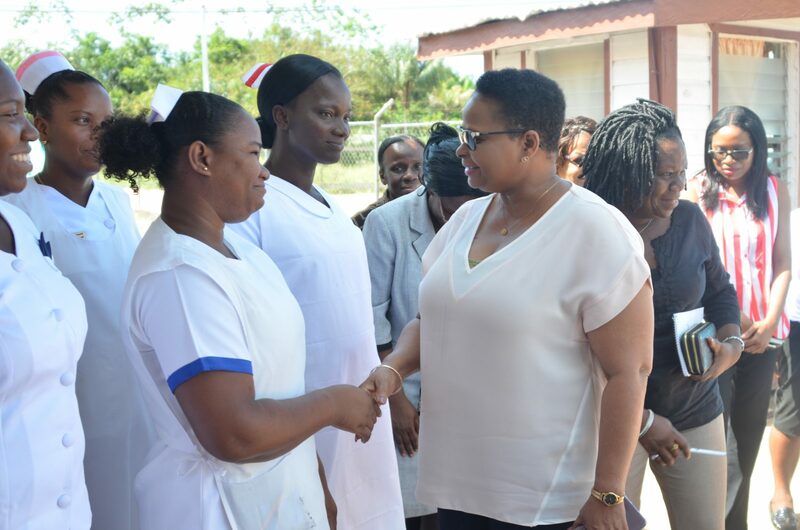 Minister of Public Health, Volda Lawrence spearheaded a team including advisors from the ministry to have a first-hand look at the working conditions of the medical staff of the Kwakwani Hospital and the Ituni Health Centre. These visits wrapped up an overarching trip by the minister and her team who along with the recently installed health committee of the Linden Hospital Complex, examined and took note of what was needed at Region Ten health facilities in order to strategically address them in the shortest possible time. After a brief tour of the Kwakwani Hospital, Minister Lawrence met with staff who highlighted existing issues and how it affected their day-to-day duties. Attention was paid to the availability of drugs and medical supplies, working and accommodation conditions for staff, staff capacity and expansion of services provided at the hospital. Minister Lawrence noted that there were some “low hanging fruits” that could be dealt with immediately while others can be treated as priorities to be addressed in the near future. Among other things, nurses asked that an administrative structure and body be set up for the hospital – personnel, accounts and finance and senior clerks were requested. This will eliminate the need for staff to travel to Linden or in some cases to the Ministry of Public Health to address outstanding matters. Some staff also suggested that the newly installed health committee could focus on upgrading the Kwakwani Hospital to function as a district hospital, providing specialized services to the community. Doctor in Charge of the Hospital, Dr. Delesia Inniss highlighted that the staff at the hospital from time to time experiences challenge during the process of medivacs and transfers to Linden. She suggested that once the Kwakwani hospital is upgraded to provide primary health care, medical technology (laboratory) and specialised services, the need for continuous medivacs and the high number of transfers to the Linden hospital will be significantly reduced. Giving a preview of the health ministry’s plans for the sector, Minister Lawrence emphasised that the integrated health service delivery network is expected to bridge gaps that exist within the system especially in Region Ten. Minister Lawrence informed the staff that the Linden Hospital Complex Health Management Committee will be looking into matters affecting health care delivery at LHC, Wismar Hospital and Kwakwani hospital. She added that the committee will be reporting directly to her and will, therefore, be responsible for the oversight of and public health-related initiatives and ongoing work at these facilities. The Health Minister is expected to return to the region to conduct a follow-up visit at the three hospitals.